Festivals mean being with the family, mouthwatering food, sweets and performing religious rituals or havans at home. The havans and prayers can, however, be nerve-wracking for many who don't know much about auspicious timings, which prayers to conduct on a particular day and where to find a pandit. Worry not. A startup in your city might be able to help you this festive season, which begins next week with the Navratri, or nine nights marked for worshipping the Hindu goddess Durga. Several startups across the country have started tapping into the spiritual market. Startups such as OnlinePrasad, Epuja and Shubhpuja are disrupting the way people worship by providing assistance in conducting religious ceremonies and letting worshippers skip long queues at temples. OnlinePrasad.com, run by Sumiran Spiritual Services Pvt. Ltd, allows users to order prasad, or devotional offerings, from the most popular temples in the country from the comfort of their homes. "This season is pretty big for us, and we have to increase resources in all departments. More than 30% of our yearly budget is allocated for this time of the year," said Goonjan Mall, who founded the company in 2012. He added that the company's average ticket size increases to Rs 2,500 during the peak season from Rs 1,000-Rs 2,000 otherwise. OnlinePrasad, which was part of Morpheus accelerator, received an undisclosed amount of investment from Chennai Angels, Hyderabad Angels, and a few other individual investors, in 2012. The company claims to gets half its business from Tier I cities while 30-35% comes from Tier II cities and the rest pours in from Tier III cities. However, Mall said smaller cities and towns have shown the most significant growth in the past two to three years. Epuja.com, which is backed by media house Bennett, Coleman and Co. Ltd through an ad-for-equity deal, allows you to book havans online at 3,600 temples across the country. The havans are conducted in a traditional manner and the startup ships the prasad to the customer. The company says sales jump 300-400% during the festival season. "We also conduct havans for NRIs, as they find it difficult to locate priests and ritual-related items the most. We conduct it for them in a temple here, and then send the CD and prasad," said Shiva Kumar, founder of ePuja Web Solutions, which runs the startup. While these players get the prasad to your doorstep for you, there are some who will not just aggregate the ingredients of a perfect puja but also do the puja for you online! 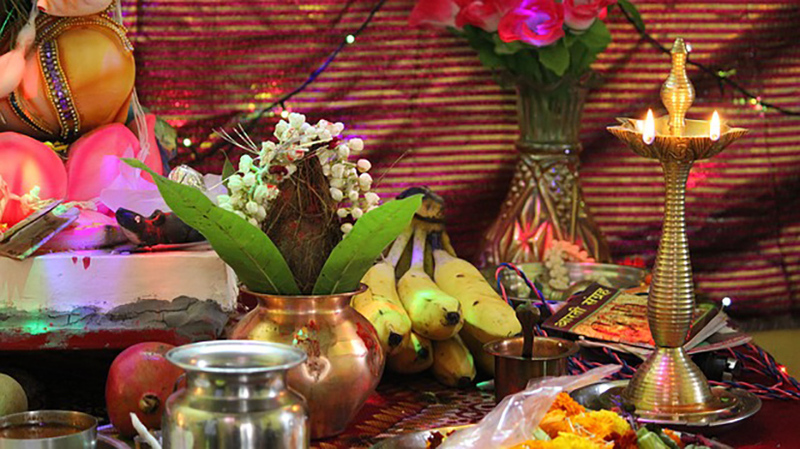 Startups such as Shubhpuja.com conduct all types of puja, except wedding and grih pravesh (conducted when one moves into a new house). All one needs to do is book a session and conduct the puja through Skype. "It's a completely new concept where you can do puja online. The users do not have to worry about how it is to be done, and what items to use, as the pandit does everything for them," said founder Saumya Vardhan. Shubhpuja allows users to book a pandit online for sessions. However, the offline services are available only in Delhi at present. The company received funding from the Indian government under the Startup India scheme in August. Vardhan, a former KPMG consultant, founded Shubhpuja Services Pvt. Ltd., which runs the startup, in 2013. The company also provides astrology consultation, horoscope consultation, numerology and palmistry services. The festive season is also marked by gifting, and doing that on a large scale for family or corporate purposes can be tedious. However, startups have rolled out special features to cater to this demand. "We are offering customised Durga Puja packs for Bengalis and Amba Ma puja packs for Gujaratis during the upcoming Navratri season, and are also making special arrangements to deliver within three hours during Dussehra and Diwali," said Vishwa Vijay Singh, co-founder of SaleBhai. "We streamlined the entire process of gifting for companies." SaleBhai Internet Pvt. Ltd., backed by BCCL's ad-for-equity platform Brand Capital, is an e-commerce marketplace for sweets, eatables, puja items, and related articles. It was founded in 2015. Investors feel the metrics for success for these startups remain the same, even though the concepts are uniquely Indian. "The business is about gaining decent consumer traction, best service offerings, market acceptance and long-term scalability vision even though the idea is unique and hovers around rituals and spiritualism unlike the western-centric businesses," said Apoorv Ranjan Sharma, co-founder and president of seed investment platform Venture Catalysts.